According to one Medicaid-financed nursing home study, many people receiving Medicaid coverage for nursing home stays in Oregon found that their coverage is substantially shorter than the rest of the country. While this may not have too much bearing in Michigan, it’s still somewhat startling to think that over half of people who receive Medicaid do not receive benefits until after they move into a nursing home. Roughly half of nursing home costs are paid by Medicaid, with the other costs being covered by income contributions and a variety of other sources. Becoming eligible until after entering long-term care can be problematic, especially if patients are trying to make ends meet. Fortunately, there are other options besides personal income that can help cover costs while enrollees are awaiting their eligibility status. Long-term care insurance, for example, is one such option. There are many different types of long-term care coverage insurance policies available today, and no specific one is right for everybody. That being said, individuals entering long-term care (or family members who are managing their care) should speak with an elder care attorney to discuss their specific health needs to determine the best coverage option for them. 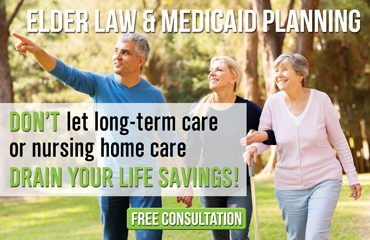 An elder care attorney can also help an individual apply for Medicaid, thereby reducing the necessity of going through all the hoops and hurdles by themselves.